Roses are Teal, Black, Lilac or any other colour you’d like! I now also have a beautiful sophisticated black set available from my Etsy shop. This set features eye-catching ruby red Czech glass beads with a Picasso finish and black Toho beads. I set these roses on a thinner chain, which really adds to the elegance of the jewellery. 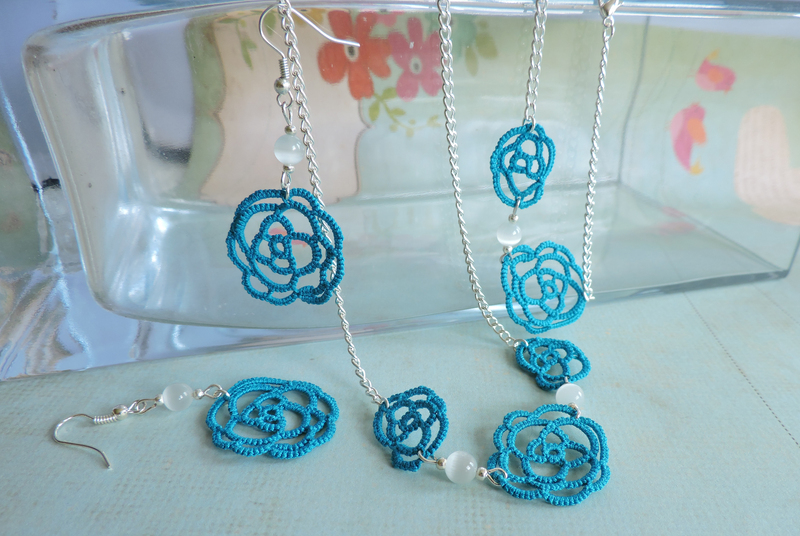 Just this week I also added another set of rose jewellery that is based on the same rose design, but each piece is longer and features more roses. This particular set is made using a variegated Lilac and Grape thread aptly named “Grape Splash” and is accented by pretty opaque purple Toho beads and 4mm Silver Lined glass beads. The 13″ bracelet is designed to wrap around your wrist twice.